Studio’s built-in Classic Title Editor is a powerful facility for creating and editing titles and other graphics. Its extensive suite of text and image effects and tools provides endless possibilities for the visual design of your movie. The Classic Title Editor is not limited to creating passive titles. For disc projects, you can also add and edit the special buttons needed for handling viewer interaction with the menus of VCD, S-VCD, DVD and Blu-ray Disc movies. Creating a title in the Classic Title Editor tool. 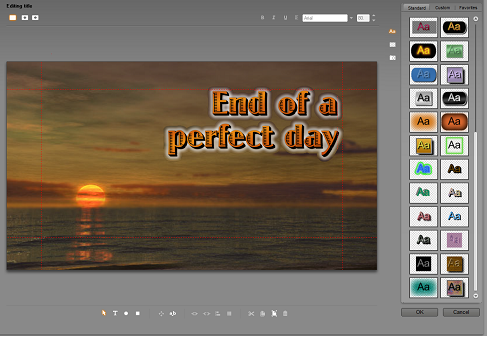 The large area containing the picture and the text is the Edit Window, while the panel occupying most of the right-hand side is the Classic Title Editor Album. Other controls are in clusters around the Edit Window. Note: Studio Ultimate includes a second title-editing tool, the Motion Titler, with animation capabilities not found in the Classic Title Editor. The Classic Title Editor also has some features the Motion Titler does not, however, including the ability to create navigable disc menus as well as titles.